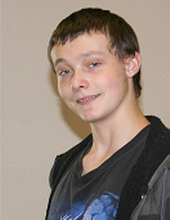 Brandon A. Carr, 19, of Colona passed away Wednesday October 4, 2016 in Colona. A memorial service will be 10am Saturday at Community Christian Church in Moline. Memorials may be made to the family. Quad Cities Cremation Center is assisting the family with arrangements. Brandon was born Nov. 19, 1995 in Moline, IL the son of Richard and Angela Wagner Carr. He graduated from Geneseo High School. Survivors include his father Richard (Michelle) Carr of Colona; step parents Todd (Heidi) Moreland of Savannah, IL; sisters Cheyanne Moreland of Savannah, IL, Allyson Moreland of Savannah, IL and Robin Atchison of Decatur, IL; brothers Michael Moreland of Hillsdale, Adam Carr of Rockford, Christopher Carr of Mt. Joy, IL, Aaron Roberts of Moline and William McGaughy of Golconda, IL. Brandon was preceded in death by his mother. To plant a tree in memory of Brandon A Carr, please visit our Tribute Store. "Email Address" would like to share the life celebration of Brandon A Carr. Click on the "link" to go to share a favorite memory or leave a condolence message for the family.